Easily get rid of your winter fur with great new products from Veet after you win them with our Contest! Just in time for summer nakedness, Veet has launched the first collection of depilatory products - Veet Natural Inspirations - inspired by nature and containing up to 100% naturally sourced ingredients! Each product is enriched with natural ingredients including grape seed oil, argan oil, shea butter and aloe for moisture and ingredients sourced from pine resin, sugar cane and potatoes are part of the depilatory formulas - and all underwent rigorous testing to ensure optimal results and offer the same long lasting, touchably smooth results as the regular versions – up to 28 days for wax products and twice as long as shaving for cream products. 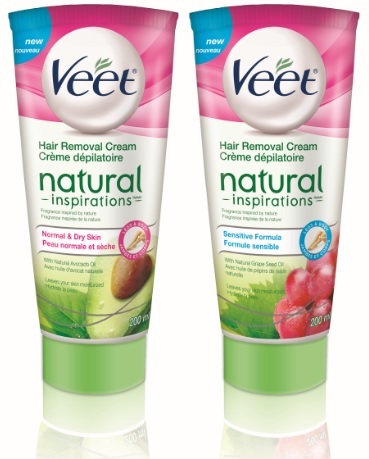 Veet Natural Inspirations Hair Removal Cream - 200ml - $12.49 - provides long-lasting smoothness for up to two times longer than shaving, working close to the root on short, stubborn hair. In 2 formulas: with natural grape seed oil for sensitive skin and natural avocado oil for normal to dry skin - to leave skin beautifully moisturized and touchably soft. It's easy to use - just apply a thick, even layer of cream, ensuring that the area is completely covered; leave on for five minutes; and rise skin with water to remove! You should decide what pain level you like for your hair removal yourself though and what better way to find out then winning the entire line! 1 entry for following and letting us know what the problem with your current hair removal method is? Or if you've found a good one, tell us about it! If you prefer not to leave your info on a public post, please leave a post saying you want to enter and then e-mail your info to info@beautycrazed.ca, please put "Veet contest" in the subject line. Remember to leave the post or you name won't actually end up in the draw! Winner to be decided by random drawing and you have until May 23rd to enter. Good Luck! I follow you via bloglovin' and read your post(s) every morning! I love keeping up to date on all the beauty trends! and you're Canadian (like me!) and that ROCKS!!!!!!!!! So I'm always looking to try new beauty hair removal products. My favourite is Veet. Honestly, it's my go to product. I buy the veet in the bottle and am always happy with the end result. My problem with my current method (shaving) is that it is time consuming, and my legs get very irritated when I shave. I have tried depilatories before with little success many years ago, so it would be great to see how they've improved! Wohooo another contest! Thanks for hosting so many! I just shave right now but I get lazy so there's always the problem of stubbles. I get little bumps from shaving. So annoying! My current hair removal method (shaving) works OK but the hair grows back so fast! I follow through GFC as Susan Terendy. I currently use an epilator on my legs and hair removal cream everywhere else. The cream that I currently use smells awful and irritates my skin so I would love to try these more natural products! I like Veet on Facebook as Susan Terendy. I follow on Bloglovin'! I shave and I have really dry skin, so I get ingrown hairs. So many little red bumps! I like Veet on facebook as Savannah Belsher-MacLean. Thanks! I follow via Bloglovin. I wish my stupid razor didn't leave me with razor burn,plus it is only smooth for a day! I have a hard time getting a close enough shave - I hate having to shave daily! I follow on bloglovin' (Suzi H) -- and my problem is that I need something that doesn't take forever to do or leave me with razor burn!